Hex Power Flower – All at Sea! This is not a map! 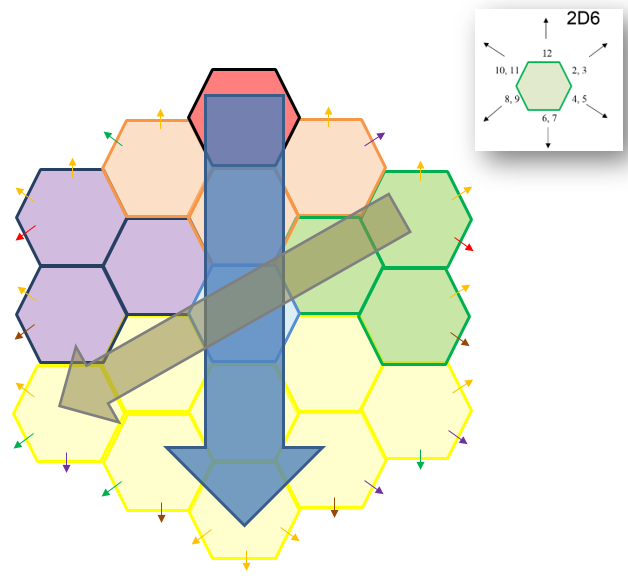 MadKingChristopher on G+ came up with this nice Ocean Mapper Hex Power Flower (HPF), which is a nice idea. It seems the ‘MadKing’ earned his crown once more, and got there before me!!! The island in the middle of the flower is a nice touch. 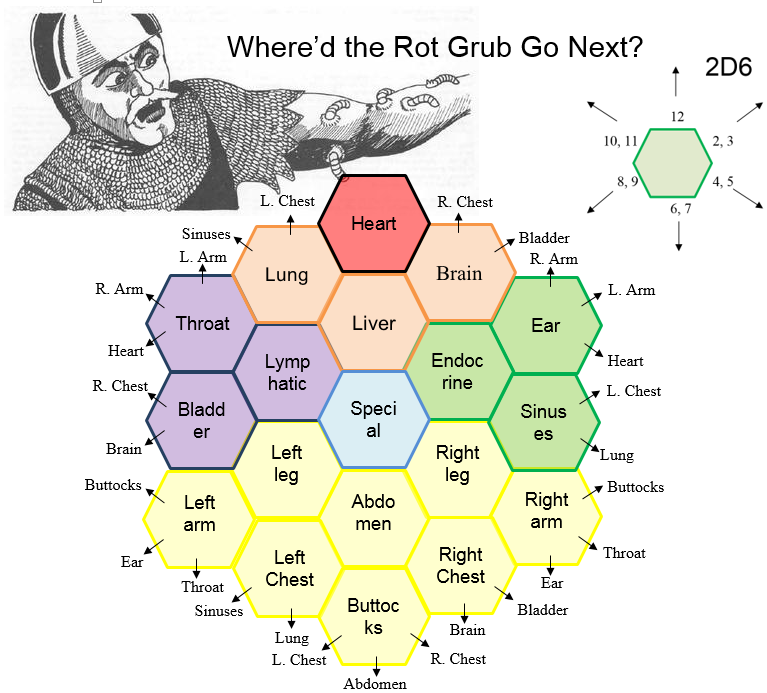 If the roll takes you to L1 (the top most hex), then proceed to the center, or (S)pecial location of Goblins Henchman’s Hex mapper. 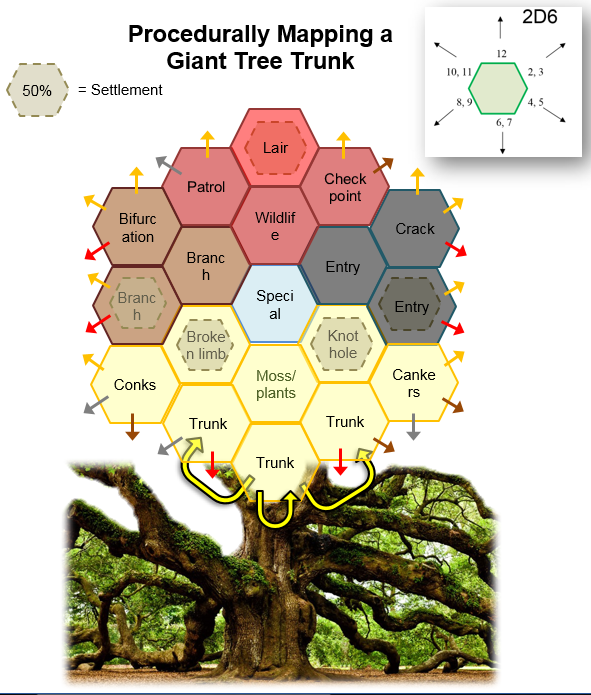 HPF – What the Hex’s Next? Me on DriveThruDriveThru; at the moment I’m mainly pimping my procedural adventure ‘Carapace‘ about a giant ant colony. 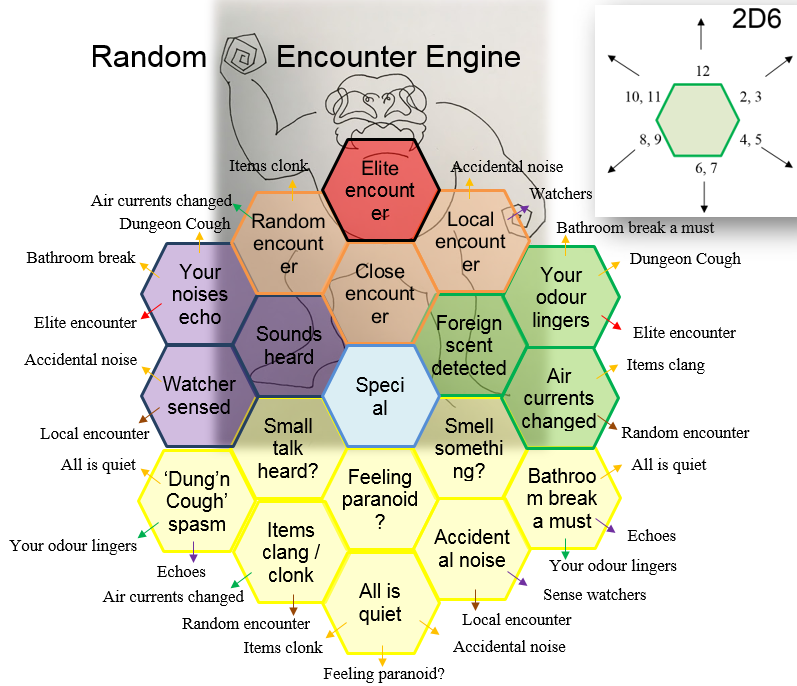 This entry was posted in Game Mechanic, Hex Flower on February 1, 2019 by Goblin's Henchman. TL;DR Summary – A versatile game engine using 2D6 and a 19-Hex Flower (it’s like a random table, but with a memory). Therefore, as one navigates the Hex Flower one is likely to head downwards, and slightly off to the left. Note these directions are tendencies only, and so there are still good/fair chances of moving in most of the other directions as well. 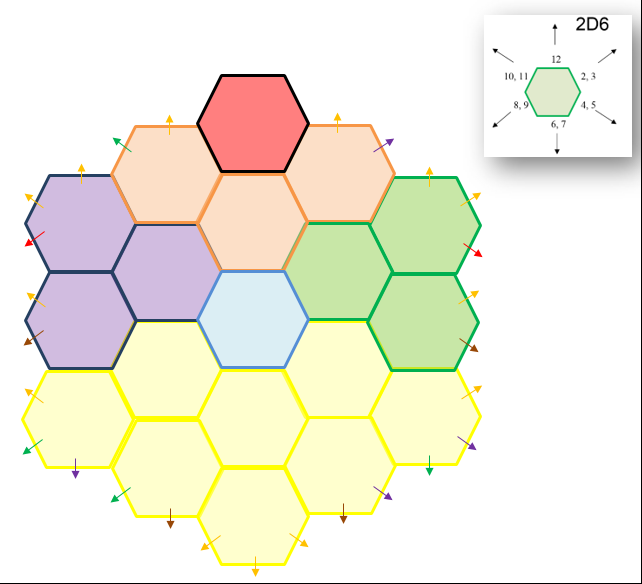 By contrast, in a simple D6 navigation system, you tend to potter around the centre of the Hex Flower, with no particular direction being favoured. To prevent stagnation (e.g. 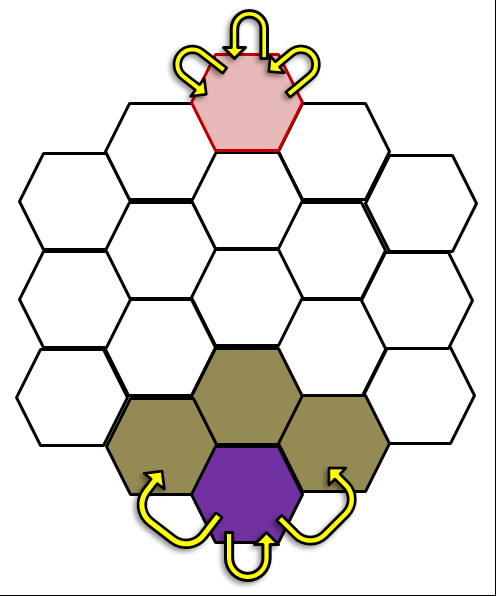 being stranded at the bottom of the Hex Flower), if you navigate off the edge of the Hex Flower, you appear on the hex which is on the opposite side of the Hex Flower (i.e. diagonally opposite, e.g. orange to green and yellow to blue in the example below), which introduces a sort of wildcard/chaotic leap. The exception to the diagonally opposite transition rule being the top-most and bottom-most Hex’s of the Hex Flower, where you typically appear on the same/adjacent Hex (otherwise this would circumvent the asymmetric vertical probability being induced into the Hex Flower). Generally, the top-most Hex returns to the top-most Hex (see red Hex below). 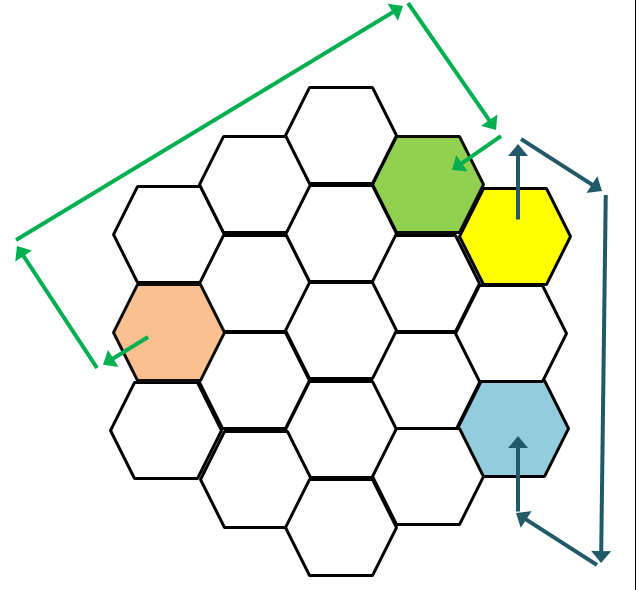 In the bottom-most Hex, I tend to move the side exits to an adjacent Hex and the bottom exit back to the bottom-most Hex, or the Hex directly above (e.g. purple to brown in the example below). Even with the wildcard leaps, there is a sense of continuity in the system, as you generally can’t get to most Hex’s without passing through adjacent Hex’s. the wildcard leaps are there to induce a chaotic element. 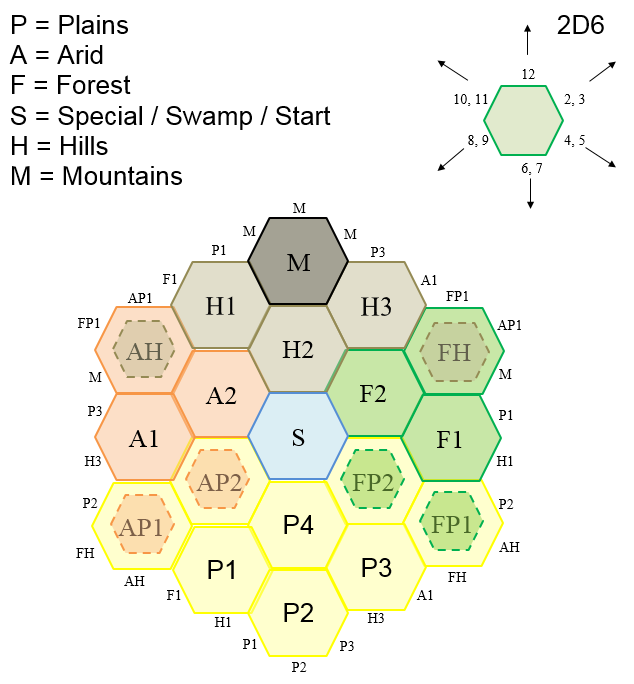 So, with an understanding of the probability structure induced in the Hex Flower you can write various engines or games. 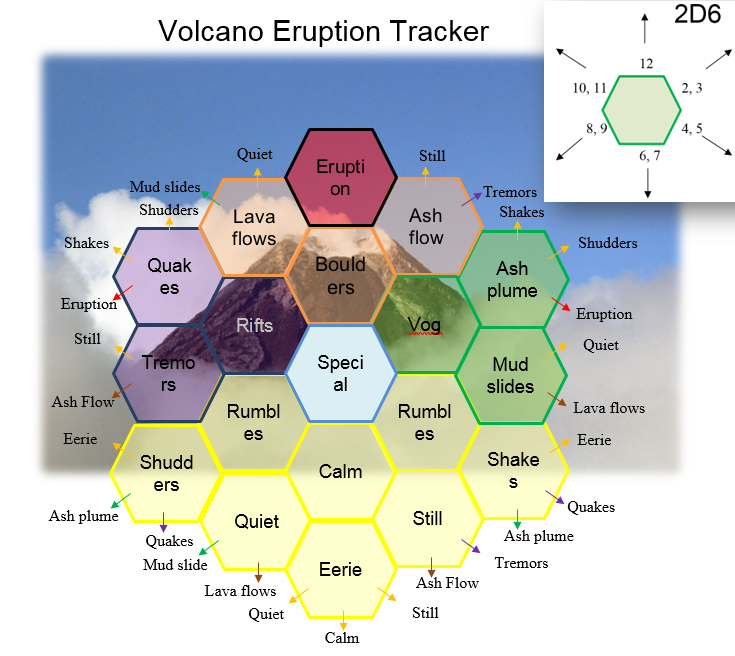 Note – this is not a map, but a tool to build a map! If you snoop around this site, you can find less fussy versions of the above engines. 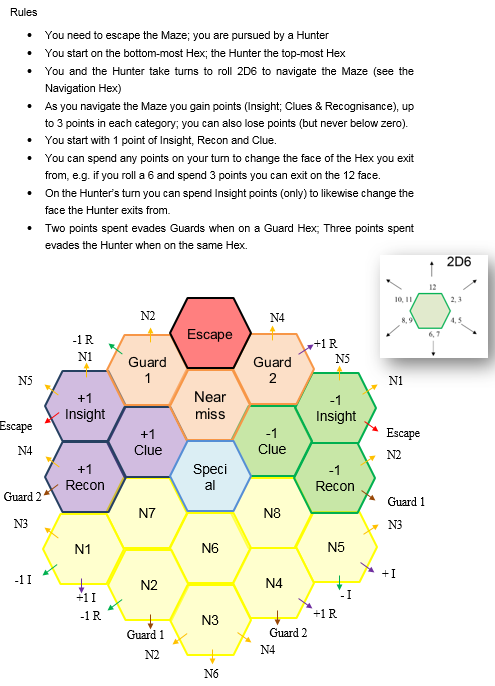 This entry was posted in Game Mechanic, Hex Flower on October 25, 2018 by Goblin's Henchman.